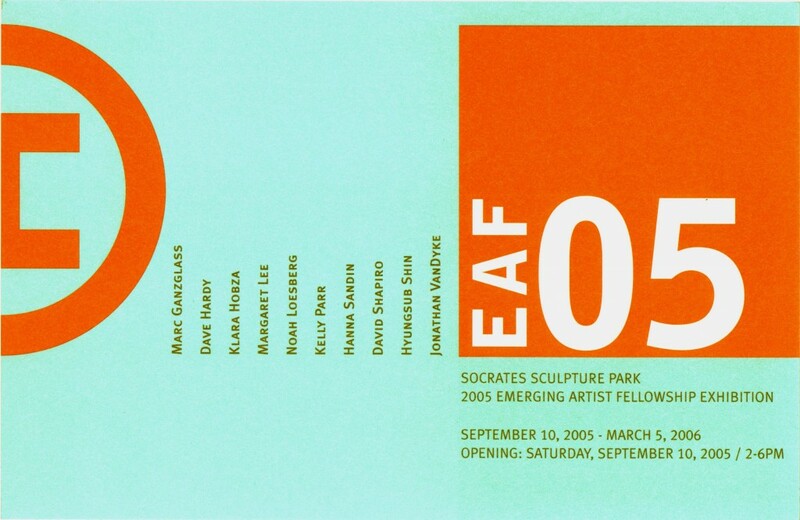 Socrates Sculpture Park is pleased to announce the opening of EAF05: 2005 Emerging Artist Fellowship Exhibition. This annual show features new works by the Park’s ten resident artists. This year’s EAF artists are Marc Ganzglass, Kelly Parr, Dave Hardy, Hanna Sandin, Klara Hobza, David Shapiro, Margaret Lee, Hyungsub Shin, Noah Loesberg, and Jonathan VanDyke. The artists are selected through an open call for proposals and are awarded a grant and a residency in the Park’s outdoor studio. Fellowship artists are also provided with technical support and access to tools, materials and equipment to facilitate the production of large-scale public sculptures for exhibition in the Park. Representing a broad range of materials, working methods and subject matter, the diverse sculptural works in this exhibition are presented against the Park’s spectacular waterfront view of the Manhattan skyline. The exhibition opening reception will feature a performance by 3 of Clubs, a trio of teenage performers who entertain crowds with acrobatics, juggling, magic, and stiltwalking. Their 45-minute shows will begin at 2:00 and 5:00 pm. This exhibition is made possible by the dedication and support of our volunteers and friends and by the generosity of: Altria Group, Inc.; Milton and Sally Avery Arts Foundation; Carnegie Corporation of New York; David R. and Vivien Collens; The Cowles Charitable Trust; Elaine Danheiser Foundation; Mark di Suvero; The Fifth Floor Foundation; Maxine and Stuart Frankel Foundation; The Horace W. Goldsmith Foundation; Agnes Gund and Daniel Shapiro; JPMorgan Chase; Richard and Ronay Menschel; Ivana Mestrovic; National Endowment for the Arts; New York State Council on the Arts; Ralph S. O’Connor; The Pincus Charitable Fund; Brooke Kamin Rapaport and Richard Rapaport; The Ross Foundation; Robert Sterling Clark Foundation; Rev. 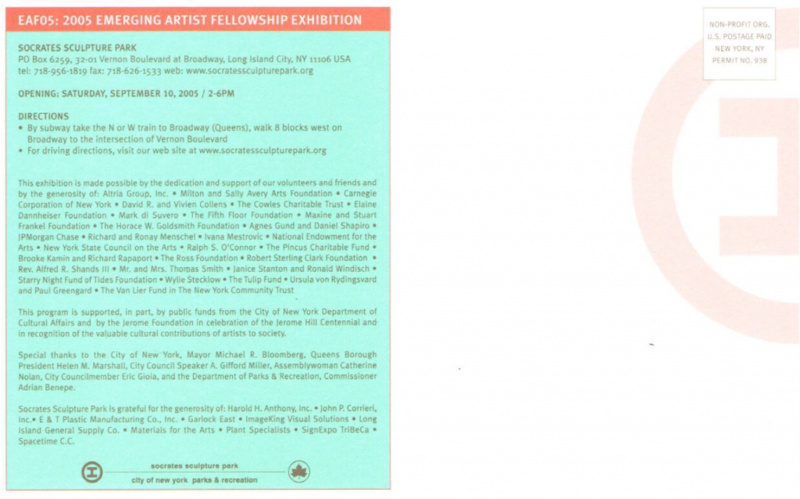 Alfred R. Shands III; Mr. and Mrs. Thomas Smith; Janice Stanton and Ronald Windisch; Starry Night Fund of Tides Foundation; Wylie Stecklow; The Tulip Fund; Ursula von Rydingsvard and Paul Greengard; The Van Lier Fund in The New York Community Trust. This program is supported, in part, by public funds from the City of New York Department of Cultural Affairs and by the Jerome Foundation in celebration of the Jerome Hill Centennial and in recognition of the valuable cultural contributions of artists to society. Special thanks to the City of New York, Mayor Michael R. Bloomberg, Queens Borough President Helen M. Marshall, City Council Speaker A. Gifford Miller, Assemblywoman Catherine Nolan, City Councilmember Eric Gioia, and the Department of Parks & Recreation, Commissioner Adrian Benepe. Socrates Sculpture Park is grateful for the generosity of: Harold H. Anthony, Inc.; John P. Corrieri, Inc.; E & TPlastic Manufacturing Co., Inc.; Garlock East; ImageKing Visual Solutions; Long Island General Supply Co.; Materials for the Arts; Plant Specialists; SignExpo TriBeCa; Spacetime C.C.